How many calories in Peanuts? See below, the Peanut calories for the different serving sizes. We provide you with the Peanut nutrition facts and the health benefits of Peanuts to help you to lose weight and eat a healthy diet. 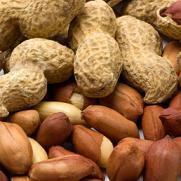 The Peanut, sometimes known as ground nut or even the monkey nut, comes from the legume family. They grow inside a hard shell, which you peel away and discard. Whilst high in both calories and carbohydrates, they are also very high in protein and other nutrients, for example nicacin, magnesium and phosphorus. Peanuts are extremely good as part of your overall diet as they contain monounsaturated fats, but watch the calories. They also compete with fruit with respect to antioxidant benefits. Niacin is thought to help with the health of your brain. Peanuts also contain reservatrol. Findings are still not conclusive but to date suggests it provides improvements to cardiovascular health and aging. There are numerous reported peanut benefits: prevention of gallstones, and possible protection against Alzheimer’s. We have several calorie tables below covering the different ways peanuts tend to be sold. There is also a nutrition table where we have compared a peanut straight out of the shell, with salted dry roasted peanuts. It is considered that if you eat a portion of nuts about twice a week, it was reported in the respected medical journal, "Obesity", that you are less likely to gain weight than those who do not eat nuts. See our nuts calories comparison chart to compare the calories in Peanuts with the other calories in nuts. All of our calorie and nutrition infrmation is provided by the US Department of Agriculture.